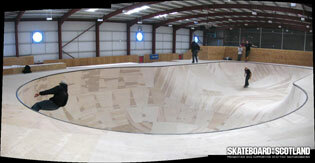 Join us for tour of the centre, for a chance to try climbing, skate or BMX….or just a coffee in the great Energy Cafe. Northsound Radio broadcasting live from Transition from 10.00am to 1.00pm. See DJ Andy James try his hand at Extreme Sports!" – From the Transition website. Transition is an awesome skatepark, check out the recent article "Transition Skatepark: Disneyland for skateboarding…" for the evidence. War of the Thistles 07 Day 1 is on the 21st at Transition, that gives everybody one week to get all the lines sorted in the park ready for the comp! Find out more including opening times, membership at http://www.transitionextreme.com/, there are also 360 panoramas of some of the facilities too.